LOSING RECORDS WAS ONE SITUATION THAT BOTH STUDENTS AND ACADEMIC INSTITUTIONS DREADED. YOU DARED NOT GO BACK TO YOUR SCHOOL 20 YEARS LATER TO LOOK FOR YOUR MISSING CERTIFICATE. EDVES HAS ARRIVED TO MAKE SURE HISTORY DOES NOT REPEAT ITSELF. I could get personal with this. I remember my mum screaming "keep your certificate safe" over and again to me while I was processing my admission into the university some years back. Years later I totally understood her cries were for my good because losing your certificate or statement of result was like the end of the road for people. It could take forever to get back any of those lost documents. I also recollect manipulating some figures on my report sheet to escape some form of punishment at home. These and more a lot of us got away with because we were so into processing things manually. Edves is an indigenous company that has designed the easiest and secure web tool platform that encompasses all school management needs. This platform addresses specific challenges with capturing data, paperwork, stress, giving speed to teaching and learning activities, working effectively with it to improve every area of school operations. Its scalable innovations are fully customized to meet individual school’s specification. Built by Dimeji Falana and his team, it has been discovered to be an easy yet powerful school management platform for any educational Institution. Regardless of any curriculum, you need a platform that can increase enrollments, retain existing students, track student & teachers performance, and help streamline academic and administration work. The most interesting part is that parents can be a part of their child(ren)'s academic state. They do not have to visit the school or wait until the end of the term to see how much progress the child(ren) is making. According to Dimeji Falana, CEO EDVES "We have inbuilt SMS platform in the Edves Portal, so Schools use this feature to communicate with parents especially to send the Continuous Assessment Results of their wards to them. This has increased the speed of communicating student grading and performance to parents without physical meetup. 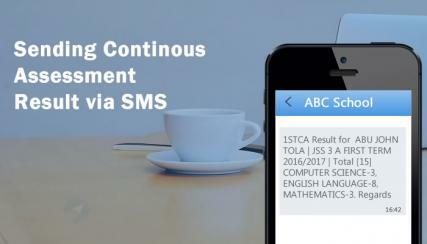 Parents are also happy to receive the result on their phones to track the academic improvement of their wards." Falana is a software developer with a 9-year experience in the software industry. As a graduate of Computer Science, University of Ilorin, he has previously led various teams to build and deploy over 100 projects such as Websites, Mobile Apps, Cloud and Desktop Applications for Banks, Schools, Businesses, Hotels, States and Federal Government in Nigeria. He was a former instructor at the AITI MIT Summer Program. His team recently secured a World Bank sponsored Grant through GEM Project, supervised by Federal Min. of Trade & Investment. He loves track events and holds 14sec 100 meter record in the Faculty of Communication and Information, the University of Ilorin in 2010. If it must be said, education in Nigeria is trailing far behind the tech train and a lot of us wonder if it will ever catch up. What Edves, a Nigerian platform built for Nigerians by Nigerians, is doing is a worthy cause. This is their effort to making sure our teachers stand up and join the future today. It is enough that the future of this country is being tutored by teachers who do not know as much as typing on a computer keyboard. Government educational institution should take advantage of this platform and help make Nigeria a part of the 4th industrial revolution. For more information visit EDVES. When talk turns to technology trends, it should also turn to Africa – because that’s where some of the world’s cutting-edge innovation is happening right now. As a result, TINK Africa, a Trends Intelligence Company in Lagos, hosted Tech Gurus and enthusiasts over the weekend to discuss The Future of Technology in Africa. Professionals in mobile technology, e-commerce, tech hubs, tech story tellers, programmers, coders, gamers and other titles involved with tech came in for a heart to heart yet professional discourse on what role Africa will be playing technology-wise in the future. Wole Ogundare is currently the Managing Director at Yudala Limited. He has spent the last 22 years as an enterprise expert focused on business building, market expansion strategies, governance and financial inter-mediation for current and potential investors in Sub Saharan Africa. His varied experience portfolio revolves around the following sectors: retail, marketing communications, telecoms, FMCG, power, solid minerals, financial services, health and agriculture. Tristan Hall is a Techie, Photographer, and Entrepreneur who is currently working as Smartphone Product Manager in Lagos, Nigeria for Samsung Electronics West Africa after a two-year period in the Africa Regional Office. Tristan has worked in Sales and Marketing roles even while writing, editing and publishing PhotoComment Magazine through first entrepreneurial years as co-founder of Comment Media. Ndukwe Onuoha's Linkedin profile reads thus; I'm an ad man. I tell brand stories with human truths. I'm a poet; I put rhyme to reason. I love politics, and will someday want to work on a campaign strategy. I believe in Abia, and I know that one day, I will change it for the better. His specialties includes Campaign Strategy, Campaign Building, Scripting for Commercials, Branding, Political Strategy. Here are quick points from the discourse. If given a vote, technology should be the most used word after hello, given the fact that in Africa, as nowhere else in the world, technology is improving people’s lives – especially mobile services and applications. With minimal fixed line phone infrastructure, the continent has embraced the opportunity to leapfrog existing technologies, becoming a world leader in the delivery of such services as well as helping to break down the barriers to energy through off-grid electricity, solar-powered phone chargers and the likes. Noted as a continent of innovation, creativity and technology with Nigeria and Kenya being recognized as the fastest growing of the innovation hubs on the continent, the world is watching as she makes effort not to be left behind in the scheme of things. Offices get to save more time when renovating and or setting up for work, rather than spending weeks or months and paying outrageous amounts of money. The product was created by a business founded by Henry Obinugwu, called VNTS. It simply transmits high speed data across any office building without having to install any new cables, hence saving time and money. NetPremise® which has only 511 left in stock and goes for 40,000 naira, transmits high-speed data through the electrical cables already available in any building and sends it out either wireless or through the wired Ethernet Ports on the device. This makes Wi-Fi deployment or extension easy and cost-effective; and as there is no need of installing new structural data cable it minimizes business disruption, downtime and offers great user experience. With NetPremise you don’t need to spend money on extra routers or cables. It simply uses your already existing electricity wiring in the building to transmit internet. Just attach one to your router and plug it to the wall. Take the next one to wherever you are experiencing low network and the signals will improve immediately. This is because there are no obstructions since internet signals are being transmitted through the walls using already existing electrical wiring. Sounds like a great deal yes? THE MORE LIKES THE BETTER! BSCHOOL'S MASTERCLASS FACILITATOR HAS SHOWN THAT THE WAY HAS BEEN PAVED FOR MESSENGER BOTS TO TAKE OVER DISEMMINATION OF INFORMATION. The more likes, the better! It is undeniable. Digital marketing has catapulted past analog. People are consuming more digital content daily – using their smartphones, desktops computers, laptops, tablets, and more. Smart brands have capitalised on the digital trend and have made it big. The digital space is wide enough for all to take part in but less than 25 percent of businesses especially, SME's have fully utilised the power of Digital Marketing either because they are doing the right thing the wrong way. The thing is, companies need to recognise that they need to alter their marketing strategies to adapt to result-oriented plan. Over the weekend TINK's bshool held another of its free masterclasses, this time with a focus on Digital Acceleration and ace Digital Strategist, Okemini Otum was the facilitator. As seen on his Instagram profile, "I help Business become more desirable online and attract the right customers." Okemini is a tech enthusiast and a key player in the Digital and Social Media field. He is also a Digital Business Strategist, Blogger, Google Ad-words professional, Social Media Consultant, Facilitator & Trainer. He has worked with over 22 start-ups and SMEs and has an in-depth understanding and navigation of the tech ecosystem in Nigeria and Africa as a whole. He is at the cutting edge of technology and is in constant search of online tools and methodology to improve business and efficiency. His opening words were as follows; "If you're Tech oriented or business inclined, learn to create Messenger Bots because that the where the world is headed." He revealed that Giant brands like CNN are using Bots for the dissemination of information. During the masterclass, attendees learnt that as a PR consultant, digital marketer, social media manager, content creator and content curator there are available tools that can help make the job faster and more professionals. Tools like Twitonomy, Co-schedule Headline Analyzer, Feedly, Google Alert, Grammarly and so many others. He reiterated that as a business, people are spying on you just as you're spying on them. The usefulness of this is to look at the way they do theirs and take a lesson out of it. Please scroll below at the pictures of the day. The benefits of digital marketing seem unavoidably huge for all brands especially, small businesses. It doesn’t have to cost you a lot and it can be highly effective in acquiring new customers, making sales and servicing customers in real time. It is also clear that without the requisite awareness, knowledge and skill in digital marketing there isn’t a hope in hell you will achieve success. It must be added that business should not just rely on marketing agencies knowledge or skill, they should learn to use the digital space to boost business. Following a prior promise, the federal government has now commenced registration of unemployed Nigerian youths all geared towards not only unemployment rate reduction, but job creation. But, i have questions, is this any different from the job promises from years before, does the data base automatically create jobs or is it just a platform that will die a silwnt death and raise and simultanoeudly kill the faith stirred up in these young hopeful Nigerians? The Deputy Director, Information and Public Relations of the National Directorate of Employment (NDE), Edmund Onwuliri, announced in a statement, that the registration exercise geared towards collecting the recent data of unemployed Nigerians is being carried out in compliance with the NDE’s mandate to obtain and maintain a data bank on unemployment and vacancies in the country. According to TrendingEconomics, Nigeria's unemployment rate rose for the seventh straight quarter to 13.9 percent in the third quarter of 2016 from 13.3 percent in the previous period. It was the highest level since 2009, as the number of unemployed rose by 5.2 percent to 11.2 million, employment rose at a much slower 0.6 percent to 69.5 million and the labour force increased 1 percent to 80.7 million. Meanwhile, youth unemployment rate increased to 25 percent from 24 percent in the previous period. A year earlier, the unemployment rate was recorded at 9.9 percent. Unemployment Rate in Nigeria averaged 9.52 percent from 2006 until 2016, reaching an all time high of 19.70 percent in the fourth quarter of 2009 and a record low of 5.10 percent in the fourth quarter of 2010. The online portal will capture all the relevant data of all the unemployed persons who register, and serve as a job exchange platform linking job seekers and employers. Wait! Online? So the government expects unemployed people to first have proper functioning smartphones and then be able to pay for subscriptions? Even we that work have to grudgingly subscribe to these things to be in tandem with the rest of the world. So if they claim this initiative is to help these people get jobs; i would rightfully suggest a representative from each local government, area or even street depending on how the geographic division wants to be done, should be chosen and serve as a liaison between the government/ companies and these youths; so there is a vacancy and the information is circulated by the representative on behalf of the organisation and qualified candidates apply and go for interviews. Honestly speaking if you are looking for a job, all your money goes into going for countless job interviews and maybe eating from time to time, so going to a cafe or buying data is not really a necessity unless you are under-employed and can afford that luxury. Also it might be time to stop waiting on the government, it is no longer news that they do not care or at least as much as they should; so start something on your own after conducting in depth market research of course.